A honey extractor is a device that uses centrifugal force in squeezing honey out of the comb. They come in various sizes and styles and are designed to meet virtually any need and budget. However, for excellent efficiency, consider a model that can at least take in four frames at a time. 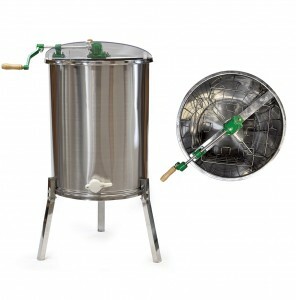 Honey extractors are available for sale online, so you can order one and have it shipped right to your door. You can have one honey extractor for several hives. Click here to check the prices of honey extractors over at Amazon.com. For a more detailed look at honey extractors, click here. Uncapping knives are used for slicing quickly and cleanly through wax cappings on the honeycomb. These cappings normally create an airtight seal on the cells that house the honey, making it hard to extract. With the electrically heated uncapping knife, you are able to remove the “lids” in order to extract the honey from the combs. If you do not have the electric knife, you can still use a large serrated bread knife. Dip it in hot water then wipe it dry before using it so as to avoid diluting the honey. Click here to check the prices of uncapping knives over at Amazon.com. Before you bottle the extracted honey you need to strain it. By straining the honey you are able to remove some tiny bits of wax, sticky bees, wood and any other small particles. To do this, you can use any type of conventional kitchen strainer or a fine-sieved colander. Nonetheless, you can still acquire a nice stainless-steel honey strainer from any beekeeping supplier. 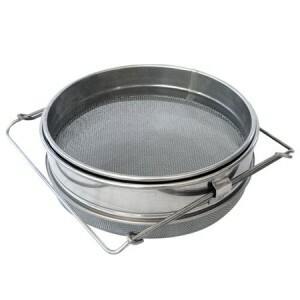 Click here to check the prices of honey strainers over at Amazon.com. 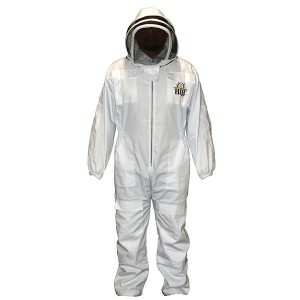 A beekeeper suit is very essential for any beekeeper, whether amateur or an expert. It gives the user confidence when around the bees. Even the most docile bees can send one or two sentinels that may scare you away. You should get a good quality suit, preferably one made with light color. Avoid any that has stripes or fancy imagery. Bees dislike wooly or rough materials. You should also avoid materials that have oil or animal scent. Always ensure any gap or hole in the suit is covered since bees always find away in. For the gloves use leather or thick latex material gloves. Thin materials can easily be penetrated by a bee sting and bees tend to sting the same spot. Click here to check the prices of beekeeper suits over at Amazon.com. The bee brush is a tool used to brush bees off the frames before they are placed into the extractor. Gently use the bee brush so as not to harm the bees. The ideal procedure for brushing off bees is to turn the frames upside down prior to brushing. 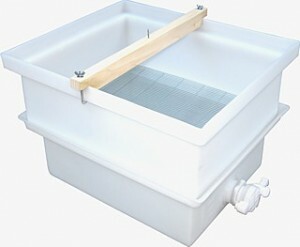 This ensures the bees will drop off easily so you can get the job done easily with few or no losses. You can also brush the frames upwards to get similar results. This is due to the fact that the honeycomb is made such that both of its sides angle up from the center of the comb. Brushing the bees downwards with the frame upright means you are brushing the bees against the angle up comb. This has a detrimental effect where the cells are uncapped. The bees’ legs get jammed and you end up killing most of the bees. So be careful not to do that. 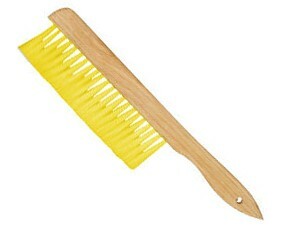 Click here to check the prices of bee brushes over at Amazon.com. 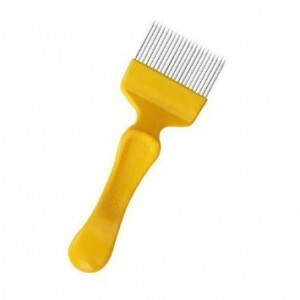 This nifty device is useful when collecting wax cappings when they are sliced off the comb. It helps the user in harvesting wax cappings and reclaims the honey that drain from the cappings. You know what they say, the sweetest honey comes from the cappings. Click here to check the prices of double uncapping tanks over at Amazon.com. 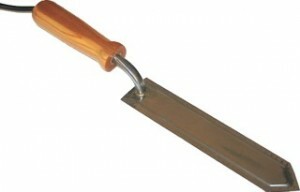 This device is used for scraping open cappings. They are usually used either as a supplement or substitute to the uncapping knife. This fork helps in opening up stubborn cells that might have been left out by the uncapping knife. Click here to check the prices of uncapping forks over at Amazon.com. 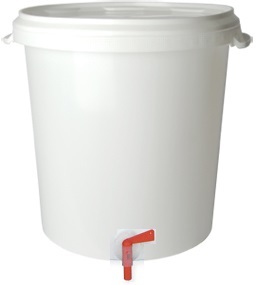 Bottling buckets come with an airtight lid and are excellent in storing and bottling honey. They are made using food-grade plastic and have a honey gate. Each pail has the ability of holding about 60 pounds of honey (will vary from manufacturer to manufacturer). Click here to check the prices of bottling buckets over at Amazon.com.